This is the fourth week in my “Eating From My Freezer/Pantry Challenge“. I am still pretty well stocked, and able to find many recipes to accomodate my stockpile of food. But, I can now see the back of the top shelf of my big freezer. Big accomplishment! Last week I invited anyone who wanted to clean out their freezer and pantry and get organized to join me in the challenge. It’s not too late to join! Just click on the hot pink refrigerator at the right side of my blog to learn more. Mrs P at Faithfullness Farm and Jeanette from Starting Over jumped right on board! Let us know how it is going! Others joining us are Yankee Doodle at From My Suitcase, Kathleen at Cusine Kathleen, Marty at A Stroll Thru Life and Lucky at Making My Own Luck. Good for all of you! Keep us posted. I also heard from my dear friend at The Tablescaper– she just took an inventory of her freezer this week. Way to go! Astrisked (*) food is from my freezer or pantry. It is my goal to use up what I have and then keep an organized freezer and moderately stocked pantry. I want to know what I have at all times so I never again have 5 frozen chickens in my freezer or will never have to run out to get ingredients for a dish in the middle of making it! Thursday’s Menu for Week of Nov 2-8, 2009, http://stonegable.blogspot.com/2009/11/sg-menu-for-nov-1-nov-7-2009.html. I have canned salmon, panko bread crumbs and onions on hand. Preheat oven 400 to degrees. Scrub baking potatoes. Place potato horizontally on a cutting board and make 5 evenly spaced cuts in the potato almost all the way through ( If you cut it through, don’t worry, just stick it together when you wrap it). The potato will fan out slightly. Slice all 4 potatoes. Place a thinly sliced onion and a pat of butter (aprox. 1 tsps.) in each slit in the potato. Onion will stick out of the potato. Salt and pepper potato. Wrap securely in aluminum foil. Put potatoes on baking sheet and bake until done, approximately 50-60 minutes. Potato should be fork tender. Serve with foil intact and take off foil just before eating. See Chicken Picatta Recipe from Menu Nov 30- Dec 3, 2009- Tuesday’s Menu, http://stonegable.blogspot.com/2009/11/menu-nov-30-dec-4-2009.html. I have 3 veal cutlets* in the freezer, capers in the pantry and lemons in the frig. I LOVE veal and it makes a great picatta. Just replace the chicken in the recipe with the veal. Mix all ingredients except croutons and dressing. Coat salad with salad dressing and add croutons and lightly toss. I have not tried this one yet- but here is the link. 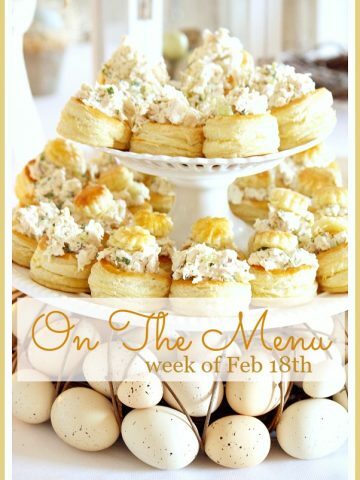 I have so many of these items in my pantry I can’t resist making it, and anything from Paula Deen has to be wonderful! Thanks to Maggie at The White Farmhouse where you will find this wonderful recipe. She posted it just for me- what a gracious friend. She knows that I am anxious, to say the least, about making the game meat in my freezer. Maggie, you are a dear. Just be near your computer for a little cyber hand-holding and encouraging! In a large skillet or dutch oven, heat 3 TBS veggie oil over medium heat. Add onions and cook until translucent and soft, about 4 minutes. Add 1 TBS veggie oil and cabbage. Salt and pepper generously. Cook on med high heat, stirring ocassionally letting cabbage wilt and brown. Add additional oil if it sticks to pan. Cook for 15-20 minutes until reduced, soft and brown. It will be mellow and sweet/savory. Yummy! Preheat oven 450 degrees. Put all veggies in a large bowl. 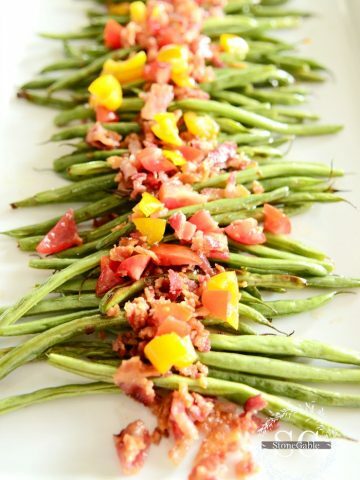 Toss with olive oil. Salt and pepper liberally. Turn veggies out onto a large baking sheet with edge. Bake for 30-40 minutes, turning once. They should all be fork tender. I have cod, cashews (instead of pecans), and most of the ingredients in this recipe. I am using hash browns from the freezer instead of shoestring potatoes. Put chicken in a large pot and cover with water and chicken stock. Put onion, celery, carrots and bouquet garni in pot on a meduim heat. Bring to a simmer and skim off any scum. Continue to simmer, uncovered for 1 hour. Remove chicken to a plate and cool. Using a hand stainer, catch all vegetables and bouquet garni in strainer and discard. Add 2 chopped carrots and celery to broth and continue to simmer for another 30 minutes. Make matzo balls according to instructions on box. Take chicken meat off of the bone and shed into the broth. Heat and add matzo balls. 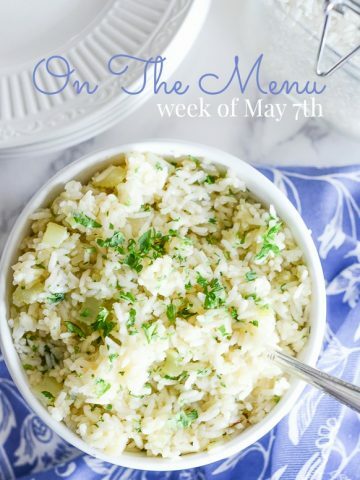 I am participating in Menu Monday at I’m An Organizing Junkie. This is all so inspirational. My freezer is packed- I want to have less on hand rather than more. Hi…Happy New Year! I can’t wait to see how the venison turns out. Not that I plan to cook any, but I’m anxious to see if you like it. Terrific looking menu, Yvonne! Great job on getting that top shelf where you can see clear to the back. It is going to take me a bit to be there BUT I’m working on it. Roasting off a chicken today for making soup and some chicken salad for later in the week. Hi Yvonne, I just heard from Angelique and your package should be in the mail by week’s end. Let me know if you don’t receive it sometime next week. Sorry for the delay! Love all of your recipes here and the pantry/freezer challenge! Great idea..
Well its baby steps for me but I do have the big freezer in the garage under control and I’m pretty happy with that. A couple of “unidentifiables” that I need to toss but husband was pleased with the results of your challenge and the meals he received last week as opposed to take out. 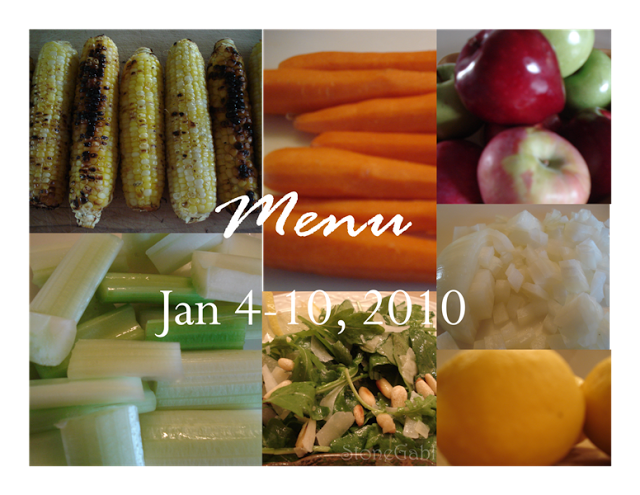 I am nowhere near disciplined enough to do a weeks menu right now but look forward to the inspiration of your menus. Hey I just thought of something. Did you ever get your big honking cloche from the fat man in the red suit? I know you are on his nice list. I emailed you earlier this week but it sounds like perhaps it didn’t go through. I was afraid that you were going to say you hadn’t received your pkg. I will try to email you again to explain what is going on. As always your menu sounds delicious! I can’t wait til Thursday. I am sure that you will be just fine though. With everything else that you have done, I am sure that this will be a snap for you. I will ALWAYS be there for you! I didn’t send the invite (snicker) cause you my dear friend have an open invitation to my house. Feel free to “pop on over” anytime you are in the neighborhood! You will always be welcome! I really do find it valuable time spent to not only plan a menu, but use up the things in our freezer on a fairly regular basis. Love the blog! I’ve been blog stalking for a while now, but don’t think I’ve ever posted. 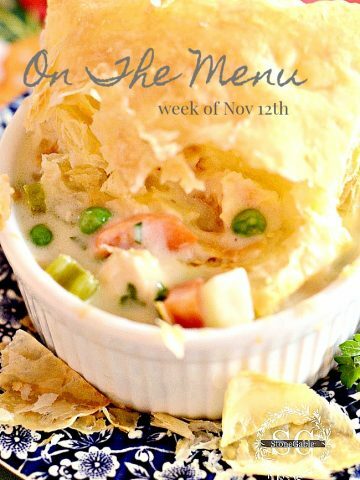 I dont have any Salmon or Cod in our freezer right now, but those recipes sound so good and would make a welcome change to all the Turkey and beef we have been consuming. Happy New Year Yvonne, Kathy. Sounds great. I did an inventory of my freezers and started a menu for the week. You have been a great inspiration! Everything sounds so good! I am still working on my menu for this week. I got some unsettling news this week and have been taken aback a bit with it. I will post about it later this week. I have not been to the grocery store for anything! I do have to go tomorrow for milk and bread. I will be posting about this challenge this week.